I’ll be honest, at first I was happy. Happy it actually worked. Happy to be done shooting for this month. Happy I actually managed to pull off a shot that resembled what I had envisioned. Once I started editing I realized there were some things I simply couldn’t/shouldn’t do in post. Yup you guessed it – there are changes I want to make. Working with a deadline is a healthy practice even if I don’t have a client, even if I just want the freedom to “play around”. I do still have 4 days and therefore changes will be made. 1. Ambient light. This scene is full of rogue light. Light from the shadow light from the constant light I have in the background light from the flashgun projecting the cross, and it all has a purpose, but it distorts the subject in ways that I am not happy with. See the huge shadow from right to left on the table? That’s coming from the shadow projected on the background. Cleaning up most of those problems should be simple. Instead of projecting from in front towards the background I will project from behind. The background is opaque so I should be able to achieve the same shadow and cross projections, but better isolate the room from the background. Repositioning the constant lights will help illuminate what I intend to illuminate. 2. Color cast. Notice how blue the fringes of the cross are. Mixing a flashgun and CFLs casts two very different white balances into the same equation. There is no happy answer except to try and bring all the light sources into the same range of white. LED bulbs will replace all of the CFLs in the constant lights and a new stronger light for the shadow projection will be used. 3. The wine glass. The color of the wine is lost (I am debating how best to light that up, but more importantly the wine glass itself just doesn’t fit the image. I need a chalice, a large one, almost oversized. 4. Camera angle. Camera should be elevated just slightly. 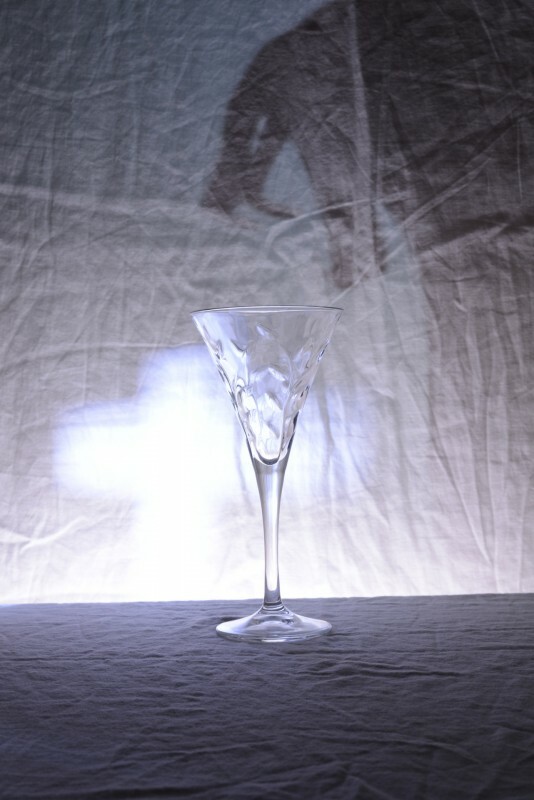 The chosen frame with little table and lots of background is good and makes the shadow more looming, but I’d like to see the whole rim of the wineglass and that requires either going lower (I don’t like this because the table will become too planar), or going higher (probably what I will do). I am going to try those 4 shanges and see what happens. Wish me luck. 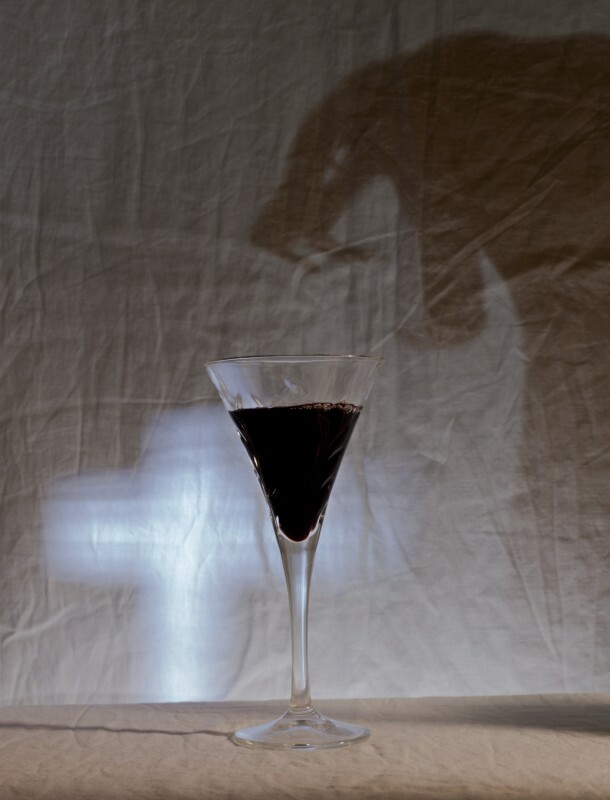 One test image that I was happy with – too bad there was no wine in the glass. This entry was posted in Photos, setup. Bookmark the permalink.